One of my cousins is having a baby in mid-December. It’s A GIRL. This is amazing because in the past 8.5 years, there have been 10 babies born to myself + my closest cousins and only 3 were girls. This is #11 and she’s a girl, so we only need 3 more girls in a row after her to be even! ha! Boys are fun, though. I love all the babies equally (though obviously mine are the best;))! Anyway, I spent a little too much time thinking about what blanket to make and eventually picked the Offset Shell stitch. I’ve made a few of these blankets, but my favorite was Big Red. It was SO bright and SO big. I loved it. 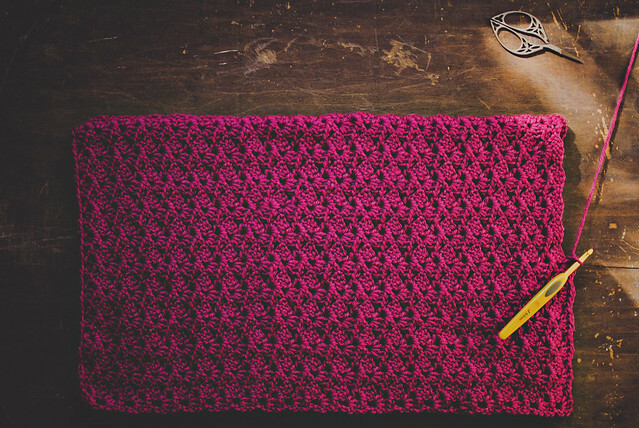 I considered making another chevron blanket, but I asked papa what the theme was and he said, “solid dark pinks…bold feminine colors…” so I began the hunt for the prettiest and boldest dark pink, newbie-friendly yarn. I started on Friday while my kids were in school. My beginning chain was 132 with a 6mm (US J) hook. This gives me a width of about 37″, but the stitch pattern is semi-lacy, so it has a bit of stretch. I imagine it stretching out nicely after a wash or two. I only bought 5 skeins of yarn (Red Heart’s Super Saver Soft in Berry) to start, but I think I’ll need at least one more. Each skein gives me about 13.75 rows. If I stick to 5 for the body of the blanket, it should be about 69 rows (39-40″ tall). I want to get to 42″, so I’ll work about 5 or 6 rows with the 6th ball before starting the border. I’ll post again when I’m done. I’m about 2.5 skeins in. This pattern works up very quickly. I can work a skein in the time it takes to watch a movie. I finished a skein the first night and worked on it a few times over the weekend. I should be done with the 5 skeins by the end of the week. What have you been working on? Any long term or semi-long term projects? I started this a little late, so I’m trying not to waste any time. I also want to knit or crochet some baby hats for her because, ummmm…winter is coming. I LOVE the color!!! Can’t wait to see it finished! This is so gorgeous! I’m IN LOVE with that berry color! I really like the colour. I think it will be gorgeous. i worked this pattern a few years ago and it was amazing! i love the color! This is beautiful, love the stitch. Think I will try it for my next prayer shawl. What yarn did you use? I loved BIG RED and had it on my bucket list… thank you for showing this! Gorgeous! I am making a scarf right now with Red Heart Soft and I’m so surprised how much I like it. Usually not a fan of Red Heart at.all. 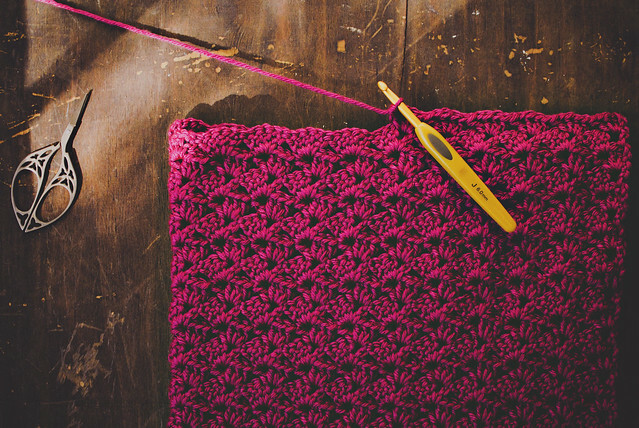 Brings back memories of scratchy stuff and all that… but this yarn is so pretty and so soft! Thanks for the info on this blanket. It is beautiful! Can’t wait to make one! Hi Lisa – Thank you for the very clear directions for the Off-set Shell Stitch. 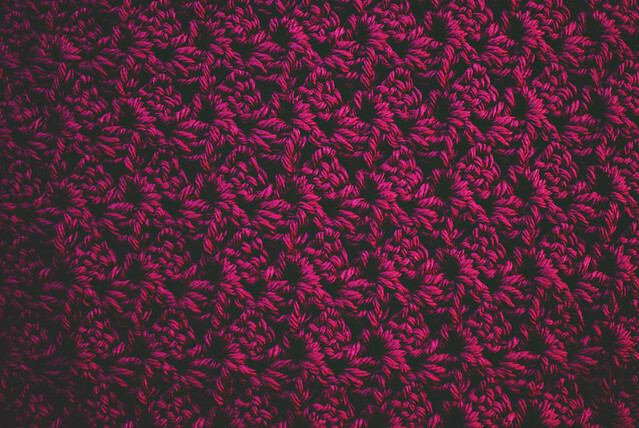 I was trying to make an item from another pattern with this stitch and it was completely confusing. Then I found you. Your blankets are beautiful and having seen them I am now going to make one for friends having their first grandchild but in aqua with a white border. Thank you for sharing. Cheers, Pamela.